transmission with wider bandwidth for higher capacity optical communication. 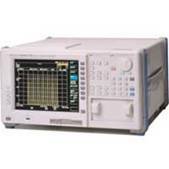 This has lead to an increasing demand for measurement equipment featuring high wavelength accuracy. The AQ6141 Multi-Wavelength Meter, with its excellent wavelength accuracy and resolvable separation measurement, answers this demand, making it ideal for a whole range of applications from DWDM system development to manufacturing. And the AQ6141 also features a new measurement function to determine narrow bandpass filter center wavelength to high accuracy.